"I felt there had been enough changes," Pederson said. What? 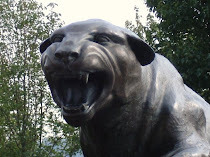 What about all of the nonsensical Pitt logo changes over the past few years...terrible cartoon looking panther, block Pitt number, Pittsburgh, new feline looking panther, jagged looking Pittsburgh. I'm probably even missing one or two. I realize he wasn't there for all of these, but he also instituted bringing back the most hated logo this past year, terrible cartoon looking panther. Sorry, I don't know what else to call it. But I guarantee you know what I'm talking about. You know - the one that looks like a four-year old had free reign on a canvas. "We didn't need to start re-inventing everything all over again. Again - then why bring back the old logo last year? We have a pretty good, recognizable brand, particularly among young people. Um, sure you do. If you asked ten different people what logo they identify Pitt with, then show them all of the current/recent logos, you'd get all sorts of answers. That's because the logo has changed approximately 1,857 times since the mid 1990s. Your logo is part of brand recognition. Seriously. This is nuts. If you look at the stadium on any game day, you'll see all kinds of kids, all ages, wearing script stuff. This is so off-the-mark, it's not even funny. and we've built a pretty good brand with our success with what we're doing, so I don't think now is the time to change much." THEN WHY HAVE THERE BEEN 1,857 LOGO CHANGES? Look it up. Pederson isn't inclined to have a throwback day on occasion, either. "We did throwbacks one time, and those things generally are exciting in a one-time deal," he said, "but they never have seemed to quite take off (in sales)." If the throwback logo isn't successful, then why are you still selling it? 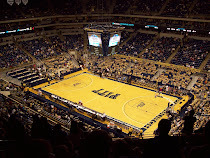 That's right - the script logo was readily available during Pitt games in the stadium and the Pete during basketball games. And it's STILL available...even with the new Nike logo merchandise. Even though this is a relatively insignificant item, I'm amazed at some of Steve's comments, which seemingly make little to no sense. And it's not like he's trying to get back to 1-2 logos. If you look on the Pitt store website, there are tons of variations. I like Steve - I think he's done a lot of good things for Pitt. But I wish he would just come out and say he doesn't like the script. When he says things like the above, it just makes people say, 'huh?'. Really, it's a bit much.